QUEEN guitarist Brian May has admitted to Newsweek that he was surprised by the success of the band's biopic, "Bohemian Rhapsody", which smashed box office records to become the highest-grossing music biopic of all time. "Nobody expected it to be that huge," May said. "We thought it would do quite well. We didn't expect it to be a record-breaking blockbuster. The guitarist went on to say that he was "delighted" with the film, and praised actor Rami Malek, who plays Freddie Mercury, as "colossal." He added: "What an incredible performance he gives. He just became Freddie." May also expressed his warm approval of Welsh actor Gwilym Lee, who played him in the movie and practised guitar with QUEEN legend to prepare for the role. "All the time we were together he was clocking me," May said. "He was absorbing what I was doing unconsciously. He's absorbing my mannerisms, my body movements, the tone of my voice. He just became me." 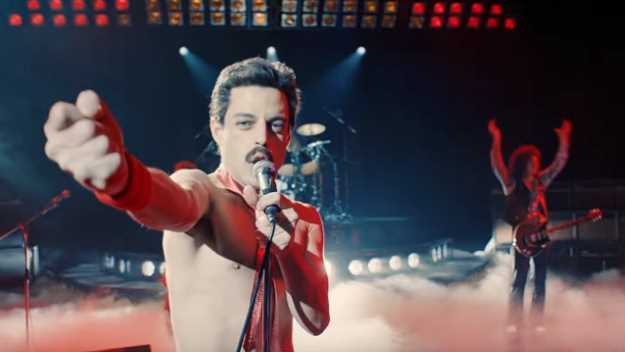 According to Deadline, "Bohemian Rhapsody" has broken music biopic records domestically ($175.7 million) and at the international box office ($433 million) for a global take of $608.7 million. The film has also garnered two Golden Globes and two SAG Award nominations. While many reviews have slammed "Bohemian Rhapsody" for its uninspired storytelling, some people have also taken issue with the movie's depiction of Mercury's sexuality - or rather, its lack thereof. The biopic focuses heavily on the relationship between him and the rock star's former fiancÃ©e Mary Austin, who discovers midway through the film that he's cheating on her with other men. May told Classic Rock magazine that the biopic was really all about Mercury. "It's very emotional. It's all about Freddie," he said. 'Yes, we are in there, but the story is about Freddie and that was always the aim. Obviously, Freddie is so precious to us. One of the great breakthroughs early on was [screenwriter] Peter Morgan saying: 'This is a film about family.' It's about all the stuff that happens in a family - some good, some bad, the going away, the searching for independence and then the nurture of the family. It's a film about that stuff, on one level, and then it's about Freddie's emerging talent, his amazing resilience and sense of humor." "Bohemian Rhapsody" began production with "X-Men" director Bryan Singer behind the camera, but the filmmaker was fired from the movie after he disappeared from set and caused production delays. Dexter Fletcher, best known for making "Eddie the Eagle", stepped in to replace Singer in the director's chair.